Understand and master the conventions that govern writing in your field. Learn the fundamental maneuvers that academic writers employ to craft their arguments. Become a skilled self-editor—essential for ensuring clarity and coherence. Learn to summarize, critique, and situate your work alongside existing scholarship in the field. Who may enrol in a writing course? Students enrolled in a graduate program at McGill. If you are currently in the thesis evaluation or per credit non-thesis extension stage, you are able to register for a course, but you will be responsible for the fees associated with those categories, along with the fees associated with the Graphos course. McGill postdoctoral fellows and non-McGill graduate students may be able to register for Graphos courses as "Special Students" in the School of Continuing Studies on a case-by-case basis (please contact us at graphos [at] mcgill.ca for more details). How do I know which Graphos course is right for me? Please review this "roadmap" of the Graphos courses to identify which course might meet your needs and experience. This is simply a guideline and not a prescription. If you want more information about a course, you can click on the course name in the section just below these images or contact us directly to learn more. NEW COURSE! CCOM 614 "Communicating Science to the Public" was launched in January 2019. Graduate students will develop their ability to write about their own research for broad audiences and to contribute to public conversations about their fields of study. Written and oral assignments provide opportunities to practice translating complex ideas and specialized knowledge into language easily understood by the public. Registration is already open in Minerva. Calendar Description: Key language learning strategies for expressing complex ideas in academic work. For graduate students across disciplines whose first language is not English: strategies for building productive scholarly vocabulary; self-editing techniques to address grammar, syntax and mechanics. Calendar Description: Key strategies for graduate students across disciplines whose first language is not English: reading scholarly texts for structure; learning to apply these structures in writing assignments. Four cornerstones of academic writing: audience, purpose, organization, and style. Identifying and targeting audiences, clarifying the purposes served by different writing projects, organizing ideas, and developing mastery of rhetorical and stylistic conventions. Audio feedback and multiple drafts. Calendar Description: Key strategies for graduate students across disciplines: reading scholarly texts for structure; learning to apply these structures in writing assignments. Four cornerstones of academic writing: audience, purpose, organization and style. Identifying and targeting audiences, clarifying the purposes served by different writing projects, organizing ideas, and developing mastery of rhetorical and stylistic conventions. Audio feedback and multiple drafts. Calendar Description: Developing pronunciation skills for effective communication in academic settings with emphasis on features of pronunciation that most affect intelligibility. Oral practice, and various forms of feedback and assessment, such as instructor, peer and self-assessment. Calendar Description: Developing and delivering academic presentations, with emphasis on how to structure content, critically evaluate content, and use rhetorical devices to enhance clarity. Oral practice, and various forms of feedback and assessment, such as instructor, peer, and self-assessment. Calendar Description: Responsible and effective engagement with other scholars’ work in order to summarize and critique research literature. Focus on economic use of language and techniques for mobilizing existing scholarship in service of an original research project. 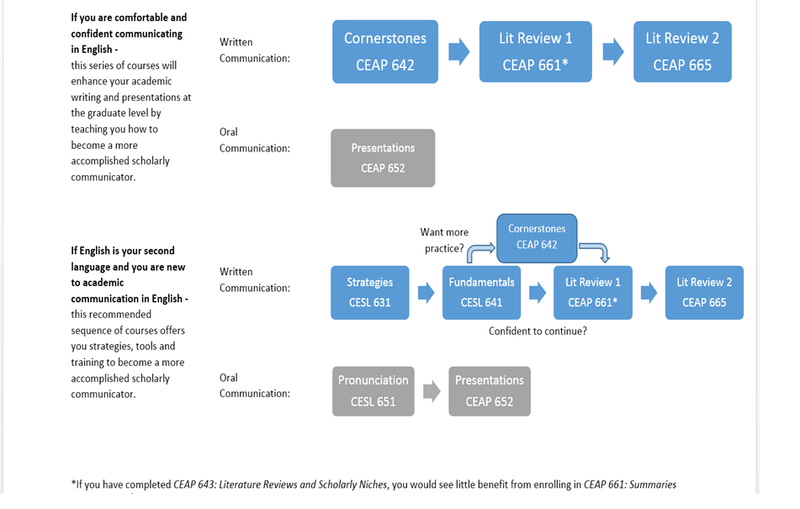 If you have completed CEAP 643: Literature Reviews and Scholarly Niches, you would see little benefit from enrolling in CEAP 661: Summaries and Critiques. Calendar Description: Situating original student research in existing scholarship through analysis of literature in a discipline; application of techniques for framing contributions. Calendar Description: Production of written and oral assignments designed to communicate scientific problems and findings to varied audiences. Analysis of the disciplinary conventions of scientific discourse in terms of audience, purpose, organization, and style; comparative rhetorical analysis of academic and popular genres. Registration for Spring courses can be completed in Minerva. List of Winter 2019 courses. Are there costs associated with taking a 1-credit Graphos course? The University has established a tuition sponsorship arrangement for Graphos 1-credit courses such that McGill graduate students in certain degree programs who register for and complete these courses do not have to pay extra tuition or copyright fees. Eligibility by Program: If you are enrolled in a full-time residency term of a doctoral program or thesis-based Master’s program, then you are eligible for tuition sponsorship. If you are currently in the thesis evaluation stage, you are not eligible for sponsorship. If you are in thesis evaluation stage, you must register as a "Special Student" in the School of Continuing Studies, and you will be responsible for the fees associated with those categories, along with the fees associated with the Graphos course. If you are considered to be externally-sponsored—that is, you have a sponsor outside of McGill (e.g., your home country’s embassy or cultural bureau) to whom your entire tuition bill is sent—then your external sponsor will be billed for the cost of the course. If your external sponsor will not pay for these courses, please contact graphos [at] mcgill.ca to see how you might be added to the University's sponsorship. Eligibility by Completion: Once you are registered for a course, you must also complete the course—that is, you must remain in the course and submit all required assignments. If you do not submit all required assignments, you will receive a mark of “J” and you will have to pay tuition and copyright fees even if you are eligible by program. If you withdraw from a course after the add/drop period, the course will appear on your transcript with a mark of "W" and you will be responsible for paying the tuition and copyright fees (even if you were eligible by program). The 'withdraw with a financial penalty' date is before 11:59pm on the date of the fourth class meeting. Graphos courses finish before the end of the regular term, and the standard add/drop and withdrawal dates do not apply. Before registering, please consult the section below for more details about Graphos add/drop/withdraw deadlines. Graphos courses are classified by the University as "extra to program" and therefore cannot be counted toward any degree requirement, the sole exception being the non-thesis Master's program in Second Language Education, toward which only CESL 641, CEAP 642, CEAP 661, and CEAP 665 may be counted: since these credits count towards completion of the program, the costs associated with the Graphos courses are included in the tuition bill. If you are uncertain about your eligibility, please send an email with your McGill ID and your program to graphos [at] mcgill.ca. PLEASE NOTE: Even if you are eligible for sponsorship, tuition and copyright fees will be assessed when you register. The amount of the fees will depend on your residency status. For the Spring/Summer 2019 graduate studies rates, please go to the Student Accounts website. While these charges will appear when you first register, if you are eligible for the sponsorship, the Graphos tuition and copyright fees will be credited back to you in one to two weeks' time. The delay is because these charges have to be credited back manually by someone in the Student Accounts office. Can I drop or withdraw from a Graphos 1-credit course? Graphos 1-credit courses run on a shortened schedule, i.e., 10 weeks as opposed to 13 weeks. In the Spring term, the courses are 5 weeks. Nevertheless, there is an add/drop period, as well as a period within which you may withdraw with penalty. For each 1-credit course in the Spring term, the add/drop and withdraw dates are determined by the start day of the class. Be sure to review the information below. Note also that these deadlines apply to the Spring session only. the add/drop period runs up to 11:59 pm on the date of the 2nd (second) class meeting. A course that is dropped by this deadline will not appear on your transcript. you may withdraw from a course with a financial penalty up to 11:59 pm on the date of the 4th (fourth) class meeting. The course will appear on your transcript with a mark of "W". Even if you are eligible for sponsorship, by withdrawing from the course at this time, you will be responsible for the tuition and copyright fees associated with the course. to withdraw from a course after the withdrawal deadline, you must submit a Course Change Request form available at Student Records Forms to your academic unit. If your unit supports your request, then the unit will forward the request to the Management of Academic Records Office, Enrolment Services, along with the recommendation from the academic unit's Graduate Program Director (GPD). Refer to https://mcgill.ca/gps/students/registration/registering-courses-0 for the most up to date registration and withdrawal policies for graduate students. NOTE: If your academic unit does not support your request for withdrawal after the deadline, you will still be responsible for the fees associated with the course, and the course will appear on your transcript with whatever mark you earn in the course. * A course that is dropped by this deadline will not appear on your transcript. ** The course will appear on your transcript with a mark of "W." Even if you are eligible for sponsorship, by withdrawing from the course, you will be responsible for the tuition and copyright fees associated with the course. Read our FAQ for other important information about Graphos 1-credit courses.